Editor-in-Chief Dr. Arshia Khan, The College of St. Scholastica, USA. 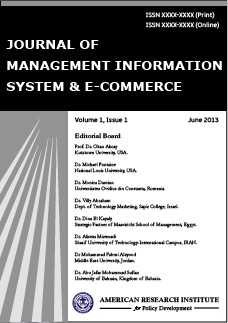 Journal of Management Information System and E-commerce is an international journal that focuses on the core tasks of information systems management, the conceptual analysis, design, and deployment of information systems, as well as on all e-business related topics. The central aim of the journal is to publish original, well-written, self-contained contributions that elucidate novel research and innovation in information systems management and e-business which advance the field fundamentally and significantly. The journal provides a vibrant forum for both academicians and industry specialists to explore the information systems and e-business. The journal follows double-blind peer review process. Each paper published in Journal of Management Information System & E-commerce is assigned a DOI®number, which appears beneath the author's affiliation in the published paper. Click HERE to know what is DOI (Digital Object Identifier)? Click HERE to retrieve Digital Object Identifiers (DOIs) for journal articles, books, and chapters. Dr. Arshia Khan, The College of St. Scholastica, USA. Dr. Pauline Ratnasingam, School of Accountancy and Computer Information Systems, University of Central Missouri, USA. Dr. Jozef Stašák, PhD., Institute of IT Systems and Specialized Subjects, Slovakia. Dr. Dalibor Stanimirovic, Department of Organization and Informatics, University of Ljubljana, Slovenia. Dr. Hassan Rawash, Dept. of Management information system, Jadara University, Jordan. Dr. A Y Dutse, Department of Management & Information Technology, A T B University, Nigeria. Dr. Abdul Manaf Bohari, Universiti Utara Malaysia, Kedah, Malaysia.